Should Journalism Be Data Driven? For my final project for Quinnipiac University’s Social Media Analytics class, I created a short presentation about journalism and data. This video is available on YouTube. My essential question was whether data and story popularity should be drivers for journalistic choices. Those choices are everything from what to put on a ‘front page’ to what to bold or italicize, to where to send scarce (and expensive) reporter resources, to what to cover at all. For news organizations looking to save some money, it can be mighty appealing to only cover the most popular story lines. News can very quickly turn into all-Kardashian, all the time, if an organization is not careful. For a news corporation searching for an easier path to profitability, hitching their metaphoric wagon to the popularity star might feel right. After all, and to borrow from last semester’s Social Media Platforms class, they have buyer personae to satisfy. If all of their readers or viewers or listeners want is to know the latest about Justin Bieber or Queen Elizabeth II, then why shouldn’t a news organization satisfy that demand? But there is a corollary to all of this. News organizations often have dissimilar foci. If I am reading, say, the Jewish Daily Forward, I am looking for news, most likely, about either the Jewish people or Israel, or at least for stories which are relevant to either of these two not-identical (albeit somewhat similar) entities. Hence a story about the Kardashians, for example, is not going to fly unless it can be related somehow. Dovetailing into all of this is journalistic ethics. Shouldn’t journalists be telling the stories of the downtrodden, the oppressed, and the forgotten? I well recall the coverage of Watergate as it was happening (even though I was a tween at the time). I’m not so sure that many people today appreciate the sort of courage that that really took. 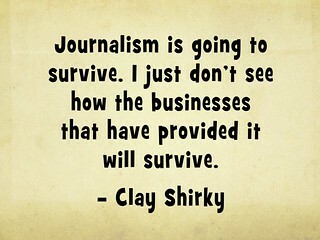 What is the future of journalism? I feel it has got to be both. There must be a combination. News organizations need to show profits just as much as all other businesses. But that should not come at the expense of their responsibilities. This was a great class, and I learned a lot. My next semester starts on August 25th.